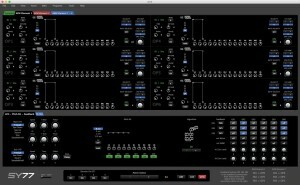 The editor is for voice editing only, no sequenser, drum or multi modes is supported. 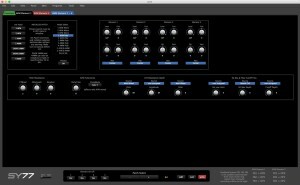 • Configure midi IN and OUT to the synth from CTRLR menu to get the editor working. • When a voice/patch is selected for editing (and edit button is pressed), there is INFO presented in bottom right corner for AFM patches feedback structure. • Feedback settings FB1 FB2 FB3, have to be manually changed for AFM patches does not update from sysex dumps like all other parameters. • Panel supports all modes except 4AFM Mono and DrumSet. • Patch Select button sends program change. 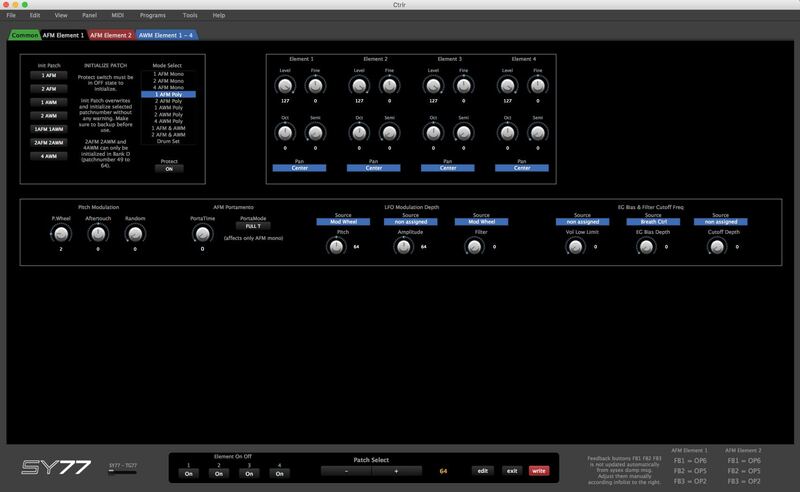 • Edit button sends dump request message, the synth enters it’s edit mode (just like pressing edit on the synth itself), to get back to “voice mode” and to be able to select other voice/patches press EXIT. • WRITE button saves the edited sound at the current selected voice/patch number. 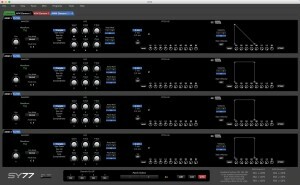 Envelope time settings or RATE (Yamaha language R1, R2…) in SY series is little different from other manufactures, 63 is shortest and 1 is longest time, rate settings in the editor is reversed so 63 is longest and 1 is shortest. • Bug fixes and parameters added. • in Feedback matrix and Algorithm select. • Some issues with AFM EG is found and corrected. • Scale envelopes and note select for all envelopes added. • Totally reworked GUI with all envelopes visible for AFM, editor size is much larger due to this change. 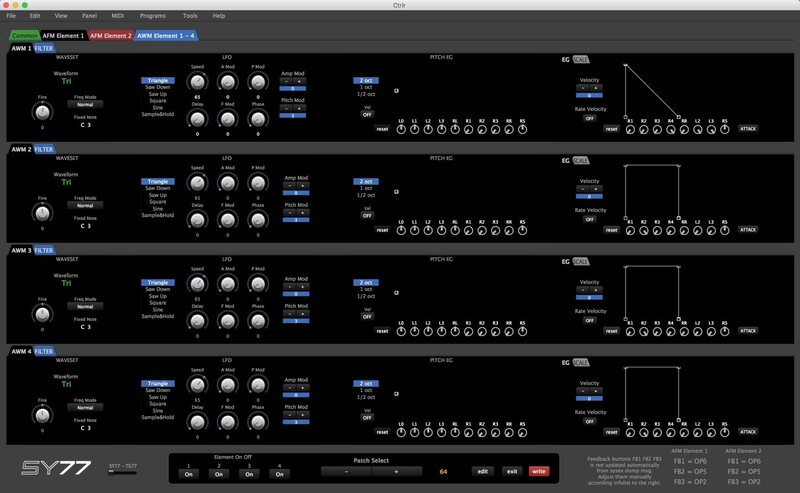 • Added support for noise and AWM in Feedback matrix and 2 input Scr for specific algorithms. • Initialize patch function in Common tab now working. 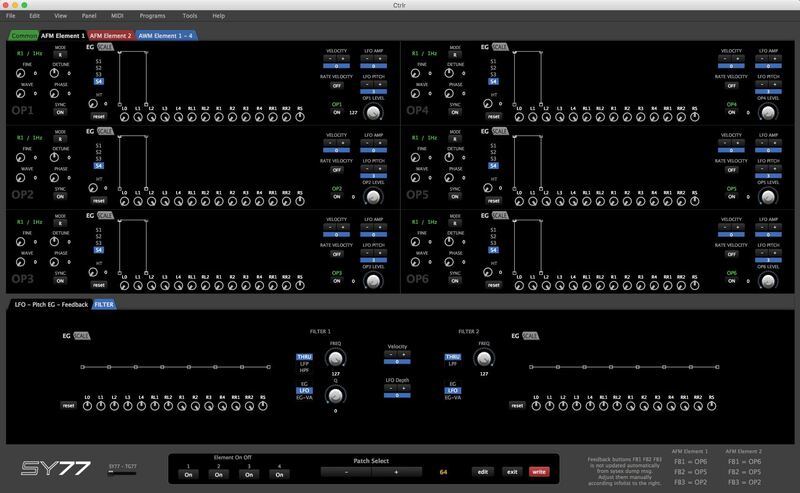 • GUI updates with new knobs and color changes. • Added 6 parameters in AFM – AWM FineTune/FreqMode/FixedNote/RateScale in pitch envelope. • Some LUA script cleanup. • Now support for TG77, switch added for SY77 or TG77 mode. from hardware sysex msg to the editor, source In1 & In2, noise & AWM. • More LUA script cleanup. in the Edit Buffer of the SY77 rather than override a patch. The choice is done using a new button. • Read this to get the ON/OFF buttons for AFM or Element 1-4 working correctly. On/Off buttons for Operators 1 – 6 in AFM Element 1 or 2 shares same sysex msg. 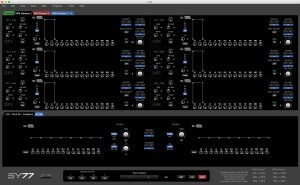 to let the synth activate it’s OSC menu/mode, then use ON/OFF buttons. Same procedure for Element 1 – 4 Mute switches. Also remember to set the editor for SY77 or TG77 mode (use the switch at bottom left). This editor was made for SY77 last year, but is tested and working for TG77, not tested with SY99. If anyone wants to do changes or add something feel free to do so. I have a couple of editors for Windows if tou need me to send you sysex commands/requests when editor knobs are moved so you can add other functions,etc. Let me know! has anyone tested for TG77 yet? I’ve got one on the way and I’m hoping it’ll work. Splendid, picked up a 77 yesterday so looking forward to checking this out. Good work !! 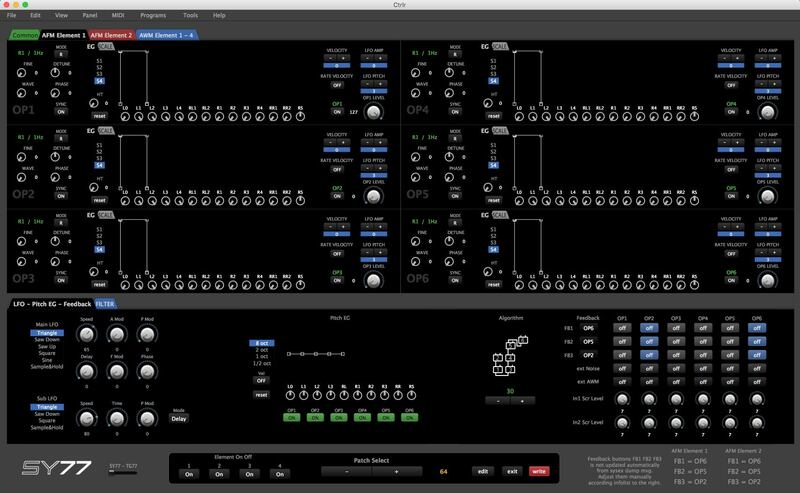 Tested this panel with a TG77, at first sight operator on/off, operator pitch eg switches and feedback routing don’t seem to work. all other parameters seem to work, great job! Many thanks for this! I’m trying to automate via Reaper VST automation the AFM operators levels and rates..but they don’t appear in the parameter list. How to do? many thanks! LOVE your panel. Thank you so much! It’s a little “glitchy” in terms of updating operator envelopes when I press “edit” but other than that it’s simply amazing. where n= Device Nr. and T2 element Nr. Is there a download link for 5.3.83? The currently nightly index skips that release. i’ve fixed some little issues with this panel. Basically (thanx @Possemo and @dasfaker for help) i’ve replaced all the getLuaData (deprecated) instances with getData. So now when entering the edit mode the panel correctly receive TG77 voice bulk dump (sorry i’ve not SY77 to test). 1. @meastempo can i upload this new version here? 3. @meastempo are you still working on it? @alfonso Yes! Please upload your updated version. Also, I’m very excited by your plans to address the freeform algorithm. That would be rad! That would be awesome! The TG77 panel is by far the best way to connect to my TG77, as most other editors seemed to have problems or huge lags when editing (I’m looking at you, SY Manager 😉 . The panel works fine, but there were some minor issues the current version couldn’t pull of, so someone to overhaul the panel would be great! As far as I can see, it is not possible to give the patch a name, is it? That would be a feature that I miss a lot. Apart from that a GREAT panel! Awesome work, guys!